This morning we bid farewell to the mittens and the rest of Monument Valley as we drove north into Utah and its wonderland of natural splendor. Fully three-fourths of Utah's land is publicly owned and under the stewardship of the state or federal government. 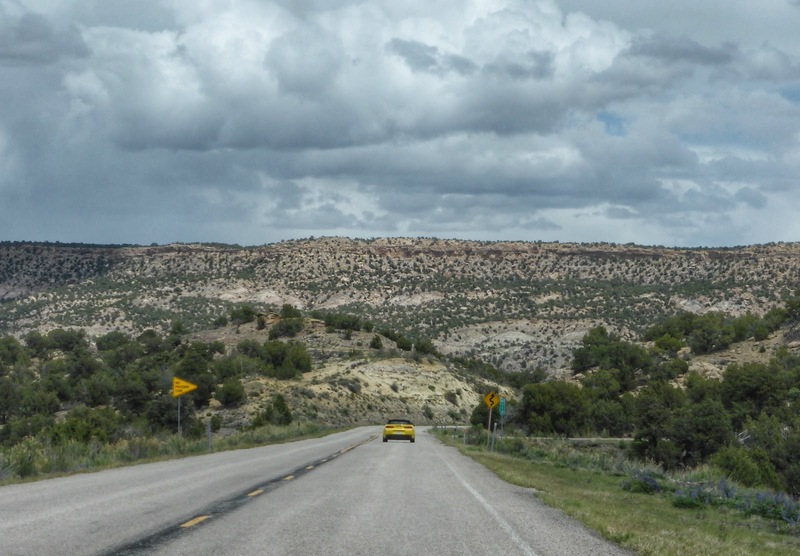 In some counties along US-89, as much as 97% of land is public. 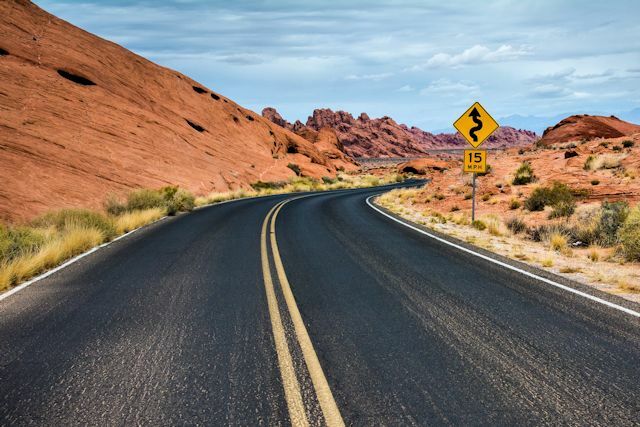 The state is home to 5 national parks, 6 national monuments, 2 national recreation areas, and one national historic site, in addition to forests, wildlife refuges, and other areas under the care of the Bureau of Land Management. On top of these federal lands, Utah has preserved a significant part of its area in 45 state parks. Though certain factions in the state would like to see these statistics change to enable individuals to extract natural resources for their own profit, the state's economy benefits greatly from a booming outdoor recreation and tourism industry made possible by public lands. 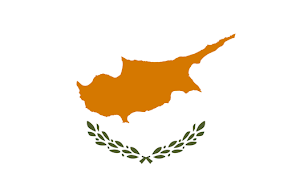 And we intend to contribute our tourist dollars to support the preservation of these natural areas. 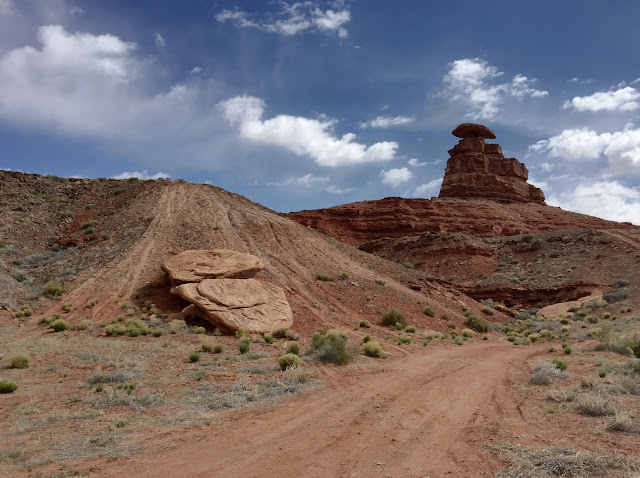 How did founders ever think to call the town Mexican Hat? 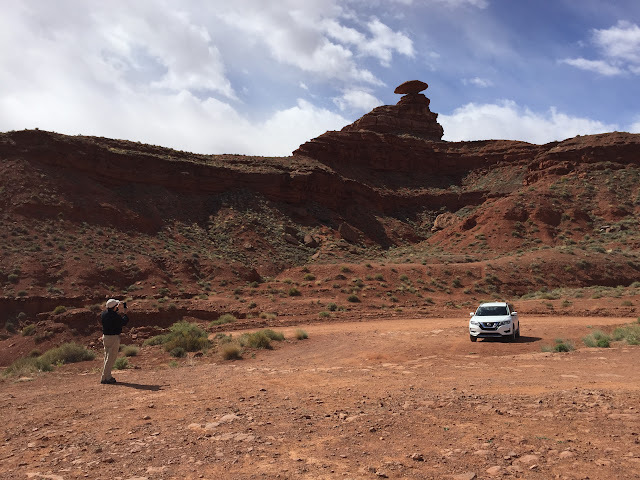 We hadn't made it very far up the road from Monument Valley before we stopped to check out the rock formation that gave the town of Mexican Hat its name. While there, we FaceTimed with cousins Bruce and Tommy in Tallahassee to share our adventure with them. Twice the fun of the better known Horseshoe Bend near Page. 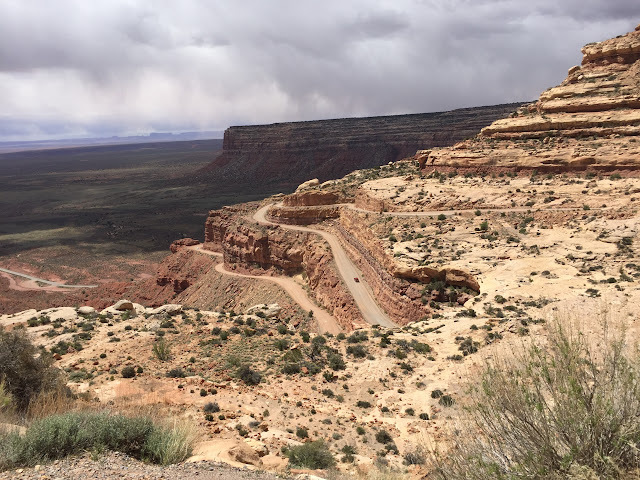 Continuing up US-163, our next must-see location was Goosenecks State Park with a viewpoint overlooking a massive meandering canyon carved out 1,000 feet below by the San Juan River. Through these twists and curves, the river flows more than six miles in a 1.5-mile distance. When we arrived, we purchased an annual Utah State Parks pass, senior rate, for $35. It's not the bargain that our $10 lifetime senior pass from the National Parks Service is, but it will reduce the cost of our visits to other state parks we plan to see in Utah. Since we were able to see Monument Valley yesterday, we had a little extra exploring time today. So when we left Goosenecks after our picnic lunch there, we decided against returning to the main road. 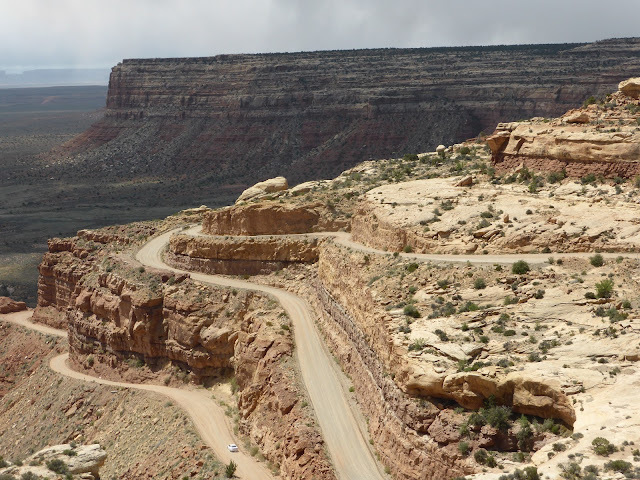 Instead, we turned north toward the Moki Dugway. 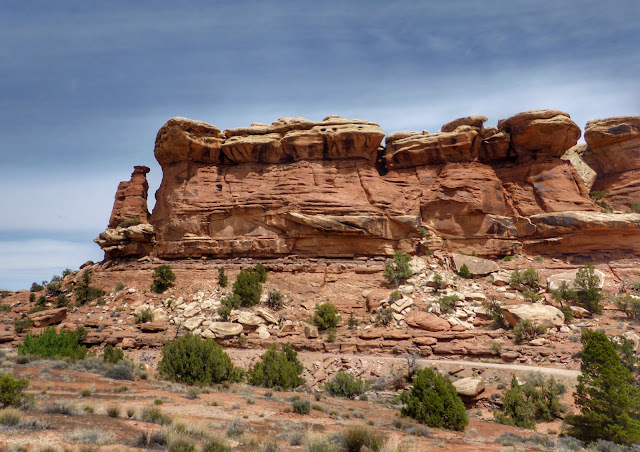 We had read about this adventurous route and wondered, as we approached Cedar Mesa, where we would be climbing to the top. Don't sugarcoat it. Tell us like it really is. Finally we came to the sign we had been expecting. 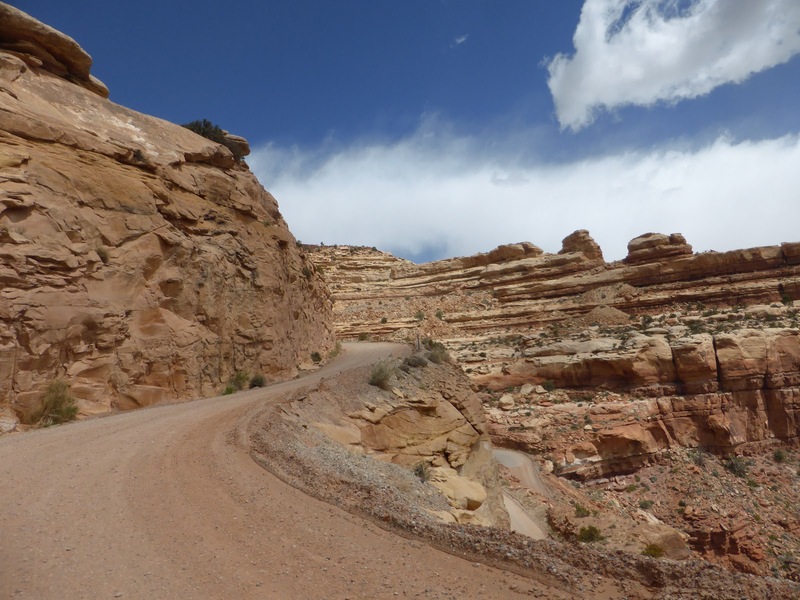 As we learned from Merriam-Webster, a dugway is a road constructed along a hillside by using for the fill on the downhill side material excavated immediately above it. 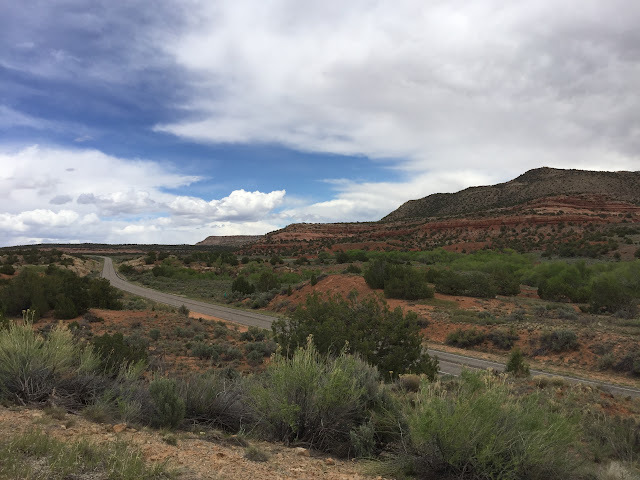 This particular dugway was constructed by a mining company in 1958 to carry uranium ore from their mine on top of Cedar Mesa to a processing plant in Mexican Hat. 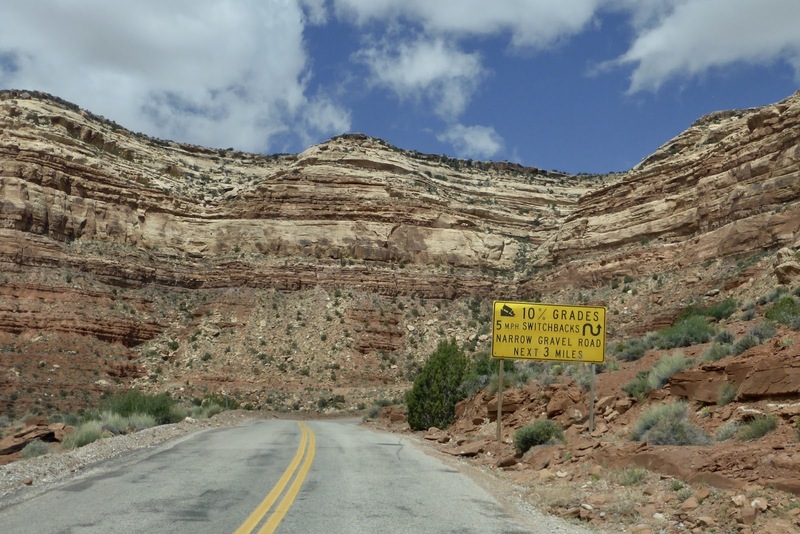 To descend the height of the mesa, a series of staggering switchbacks was carved into the hillside, gaining 1,200 feet in elevation on a three-mile stretch of unpaved road with 10-11% grades. Though it is well maintained, the road's width is more like 1.5 lanes than two, so we were relieved that we managed to avoid meeting another car along the way. With steep drop-offs and no guardrails, the Moki Dugway is not for the faint of heart. When we mustered the courage to peek over the side, we could see the remains of cars that had skirted too close to the edge. 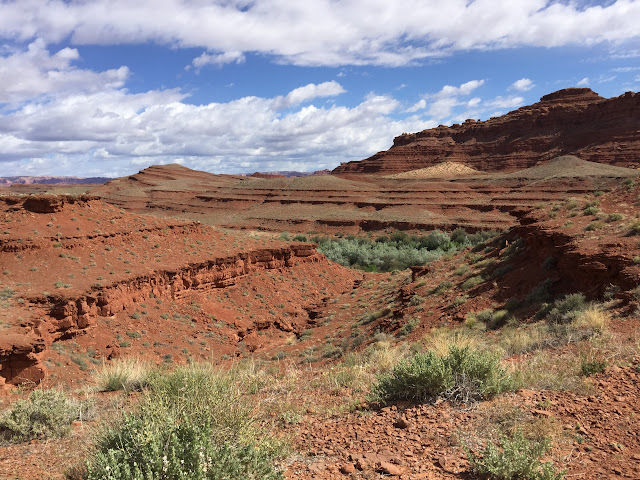 But if you looked outward rather than down, views along the way encompassed the buttes and pinnacles of the Valley of the Gods below. We appreciated a pullout for scenic views near the top so much that we planted a letterbox there. Easy to see how some cars ended up in heaps on the rocks. Once we crested Cedar Mesa, we were again on a normal width paved state highway with an abrupt change to a 55 mph speed limit. 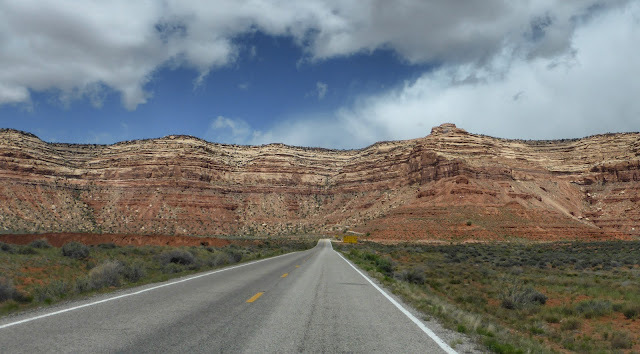 The road took us to UT-95, yet another scenic route that dead ended at US-191, the road to Moab. Sleet was falling in Blanding as we turned north for the final 20 miles of the day. By the time we reached our destination in Monticello, snow was falling in big flakes, and the temperature had dropped to 34°. It was short lived, however, and the sun re-exerted its dominance over the sky while we checked in at the hotel. After dinner at the odd Peace Tree Juice Cafe across the street, we called it a day, looking forward to exploring the southern section of Canyonlands National Park tomorrow. Loved: The stillness and quiet at Monument Valley before we left this morning. 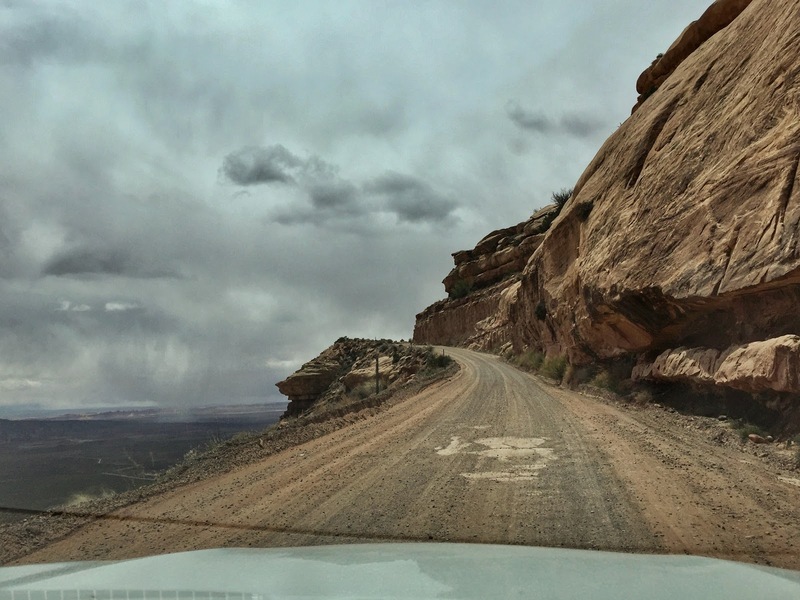 Also the fact that we were not on the Moki Dugway when snow began falling. 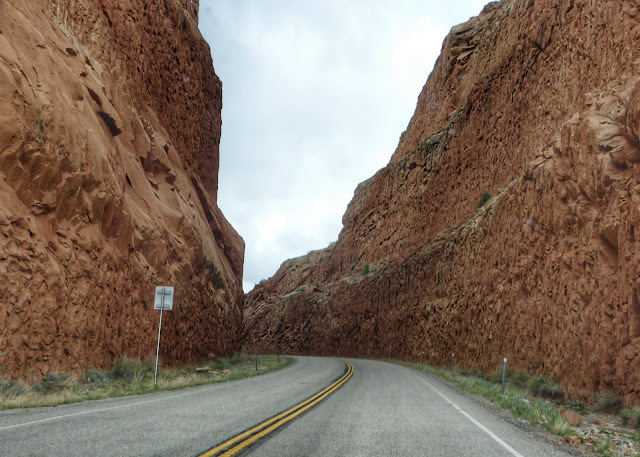 Stunning red rock scenery abounds. UT-95 is no slouch in the scenic department either. Not all rocks in southern Utah are red.